The lines, musical and otherwise, between Fact and (Science) Fiction tend to blur quite alot whenever one dares speak of (a) Our Heroes, and/or (b) The Sixties, and a better example of such dayglo-gray areas can scarcely be found than when one considers the life, art, and especially times of the one and only Jimi Hendrix. I haven't quite decided whether it's simple sentimentality at play (he was the star of the very first rock concert I ever attended), or because -- despite having a guitar close at hand myself ever since that fateful night three decades ago -- I STILL can't finger out exactly how he did what he did, but I've always reserved a very special place in my heart (and a quite sizable portion of my record collection) for the man I consider the greatest musical paratrooper ever to fall out of the Pacific Northwest. "EIGHT LITTLE-KNOWN (and most likely Rightfully So) FACTS ABOUT JAMES MARSHALL HENDRIX"
1. Let's get one thing straight right off the top here: Jimi Hendrix was not the illegitimate mutant offspring of wild Indians, raised by wolverines deep within the celestial ice caverns of Venus third moon. No, Jimi - make that Jimmy - grew up in relative normality in Seattle, Washington, I kid you knot, and his old man was a gardener fer gosh sake! Confusion similarly surrounds the other end of his life as well: For even though Jimi died in the same London flat Mama Cass (and later Keith Moon) did, it was, if you care to subscribe to such legends, Cass who was felled by a tuna-fish sandwich. Jimi choked to death on something else... still food-related, however. 3. Little Richard really did teach Jimi Hendrix everything he knew! (along with, need I remind anyone, James Brown, The Beatles, Prince, Boy George, Madonna, Snoopy Dog Dog and, of course, Michael Jackson) (and I know Richard will be letting us all know if I've left anyone out). 4. TOO MUCH MONKEE BIZNESS: Each and every rockin' popologist worth their VH-1 now know Hendrix's first major North American jaunt was as opening act for Davy, Micky, Peter and Nesmith. But did you know that when said tour hit Chicago, and the notorious Plaster Casters appeared backstage to, umm, immortalize each bands member(s) in clay, several myths were forever shattered when it turned out Jimi's family jewels failed to measure anywhere near up to those belonging to none other than "Dumb Monkee" Peter Tork! Jeez, and we always thought Mike was the biggest prick in the... oh, never mind. 5. Like all good transplanted-English psychedevians basking in the Summer of Love, Jimi Hendrix saw to it he padded out his concerts - to say nothing of his albums! - with mega-minute dollops of chemically-derived stereophonic noodling, the most exemplary of which remains "1983 (A Merman I Should Turn To Be)" (...not to mention the rest of "Electric Ladyland" side three), extracts from which can still be heard squeaking beneath scratchy archival footage of love-ins and de-lousings circa "Journey To The Center Of The Mind." Yet hidden away on the Experience's European B-sides are some of this dubious genre's "best," though least heard, doses of aural indulgence. For example: Guess what "Stars That Play with Laughing Sam's Dice" (flipside of "Burning Of The Midnight Lamp") stands for? (and you thought Lucy in the Sky with Dinah was hep!) And even more, well, fascinating was Jimi's original "teenage opera to God," entitled "Brave Ulysses' Long Lost Stash Hast Imbrued Tonto". This typically incoherent twenty-seven minute excursion into the realms of, as it was explained at the time, "electric tribal sky church rainbow music" found itself, in a brief lapse of (in)sanity, chopped off the "Axis: Bold As Love" LP (but is threatening to be exhumed soon as part of MCA/Exxon's "Essentially Rare Reprogrammed Hendrix In The Studio As You've Never Heard Before, Sorta" 12-CD Boxing Set). 6 (a). DRIED (as opposed to SOUR) GRAPES DEPT. 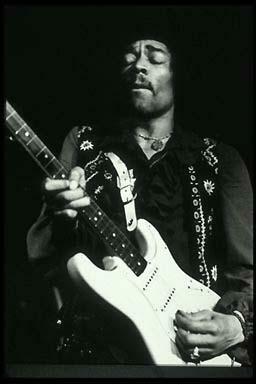 : Jimi's former drummists haven't exactly led stellar careers - or lives for that matter - since September 18, 1970. Buddy Miles, who beat behind the Hendrix Band of Gypsys was, after having been sprung from several hoosegows, the brains, to be incredibly gracious, behind the California Raisins. And Mitch Mitchell, who you should all recall was at least one-third of The Jimi Hendrix Experience, ended up hawking his road stories and then some to the highest bidder (Harmony Books), before disappearing deep into the Delete Zone. The bigger the drum kit, the harder they fall. 6 (b). Meanwhile, Noel Redding, the four-strung genius wholly responsible for "She's So Fine" and "Little Miss Strange" (...don't ask), not to mention Fat Mattress (...but that's another Little Known Facts list!) now tours New Jersey's most picturesque dives fronting a combo called (I bet this took a while) The Noel Redding Experience. He spends his off-time, of which I reckon he's got an abundance, lazing in line alongside dozens upon dozens of other ex-rhythm sections, managers, publishers, producers, promoters, valets, conga tuners, and seamstresses who, armed with the finest lawyers credit can buy, patiently await their very own turn to gnaw away at the lawsuit-ridden corpse of their former bandmate.